Today’s most famous sign of love! This emoticon pinata makes a great gift for friends and loved ones. Today’s most famous sign of love! 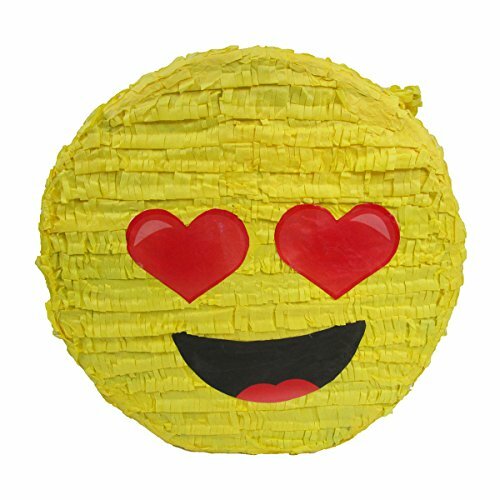 This emoticon pinata makes a great gift for friends and loved ones. Pinata measures 16″ high by 16″ long by 6″ deep and holds 2 lbs. of toys and candy (sold separately). Perfect for Emoji themed birthday parties, office events or simply for texting addicts! Makes a unique decoration, exclusive photo prop and fun party game. Comes with strong cable tie to hang pinata and opening for adding fillers.